The Space Coast Distinction - a unique combination of high tech space travel and an unmatched diverse, natural environment. The Indian River Lagoon, America's most diverse estuary, is home to more than 4,000 species, including 30 endangered species. The American bald eagle, manatee, nesting sea turtles and several endemic plant species call Brevard home. Enjoy your journey into Space Coast's natural environment! Merritt Island NWR is one of the top birding sites along the Florida Atlantic coast. 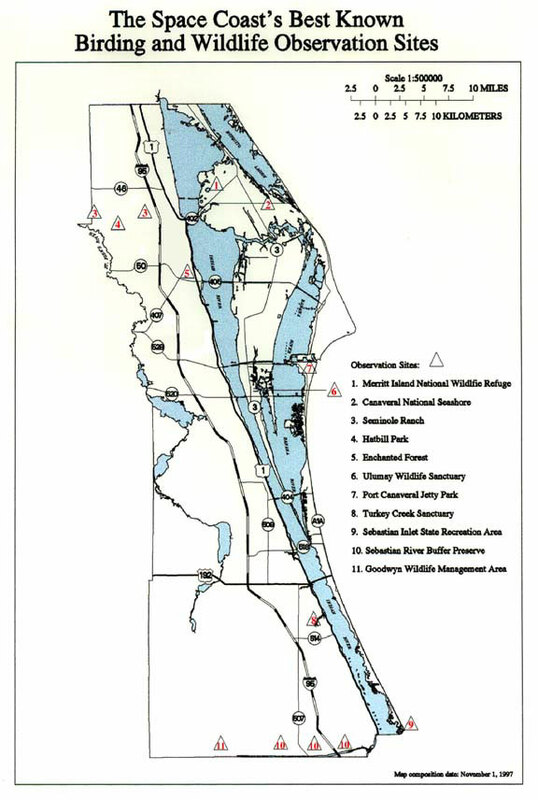 To reach the refuge from US1 in Titusville, go east on SR406 across the Indian River Lagoon. Scan the duck flocks carefully in the river along the causeway. An oldsquaw wintered here last year. There are many impoundment areas on MINWR, and vehicles are allowed on many of the dike roads. In winter, waterfowl and American coots are usually abundant here; this is also one of the best sites in Florida for northern pintails. A few Eurasian widgeons are found here almost annually. Cinnamon teal occur occasionally. One of the most productive parts of MINWR is a one-way driving loop. The Blackpoint Wildlife Drive features wading birds, waterfowl, shorebirds, gulls and terns. Most of the interior of MINWR is covered by vast scrub lands. Combined with Canaveral Seashore, the refuge contains the world's largest population of Florida scrub jays. Upland hammocks may contain migratory land birds during spring and fall. For information: Merritt Island National Wildlife Refuge, P O Box 6504, Titusville, FL 32782-6504, ph 407.861.0667. East of MINWR is Canaveral National Seashore. To reach CNS from Titusville, go east on SR406 then go right on SR402. You will pass through scrub lands where Florida scrub jays can usually be seen near the pay station (entrance fee $5.00 per car). It is hard to ignore the shuttle launch towers on the right as you drive toward the beach. The road passes slightly over three miles from the northernmost launch pad. The combination of the launch towers (especially if there's a shuttle on the pad) reflecting in a pond filled with wading birds and waterfowl is pretty hard to beat! At Playalinda Beach the road turns north and runs parallel to the beach for five miles. Sand dunes are covered with saw palmettos, sea grapes, sea oats and other coastal strand habitat. There are many boardwalks over the dune to the unspoiled beach. An occasional break in the mangroves allows a good view of the Mosquito Lagoon to the west. The beach contains wading birds, shorebirds, gulls and terns. The main draw here is the possibility of pelagic birds in fall and winter. On days with strong northeast or east winds, boobies, shearwaters, storm petrels, northern gannets and jaegers may be seen offshore. On the beach look for sanderlings, willets, red knots, ruddy turnstones, black-bellied plovers, piping plovers (rare), laughing gulls, ring-billed gulls, herring gulls, great black-backed gulls, Caspian terns, royal terns, sandwich terns (rare), common terns (rare), Forster's terns and least terns. In the fall, watch for migrating raptors. In addition to common species, merlins and peregrine falcons are seen here regularly, and some winter at the seashore and the refuge.On the way out, watch for a road (on the north side of SR402 two miles west of Playalinda Beach) which winds along the west shore of Mosquito Lagoon until it ends at SR3. In winter, wading birds, waterfowl, shorebirds, gulls and terns can be common here as well as many raptors. For information: Canaveral National Seashore, 308 Julia St, Titusville, FL 32796-3521, ph 407.267.1110. To get to Hatbill Park (a County park) go west on SR46, turn left 4.1 miles west of the I95 intersection (exit 81) and SR46. Look for signs for Loughman Lake Lodge and Seminole Ranch Conservation Area. There are hiking trails in Seminole Ranch at 1.1, 2.3 and 4.1 miles from SR46. The road to Hatbill passes through a portion of the 28,745 acre Seminole Ranch. A variety of habitats are found here including pine, palmetto, hardwood, hammocks, freshwater lakes and river, and wetlands. Certain areas have a unique plant community supported by connate saltwater which flows from small springs near Harney and Puzzle lakes. The salinity of small lakes in the area approaches one-third that of sea water. Many salt-tolerant and marine-dwelling organisms present here are not found anywhere else in the St. Johns River. Hatbill Park is a great place to be at sunrise. There are usually lots of wading birds and some small peeps along with mottled and wood ducks and other waterfowl. There are bobwhites and meadowlarks as well as red-winged blackbirds, boat-tailed and common grackles, fish crows and anhingas. You can usually find cardinals, shrikes, rufous-sided towhees and vireos here. Working along the road you may see blue jays, tufted titmice, robins, cedar waxwings, sedge and march wrens, swamp and savannah sparrows, and four species of woodpeckers (pileated, red-bellied, downy and flicker). Occasionally seen are red-headed woodpeckers and yellow-bellied sapsuckers. You can usually find pine, prairie, black and white, parula, palm, yellow-throated, and yellow-rump warblers in season. Many others may be found in migration. Solitary and white-eyed vireos are here as well as red-eyed in migration. Blue-gray gnatcatchers and brown-headed nuthatches are usually around somewhere. Barred owls, great horned owls and screech owls are also found here. For information: St. Johns River Water Management District, Land Management Division, ph 407.897.3411. Ulumay is a mosquito impoundment which has good birding except during the hot summer months. The easiest way to reach the park is from the intersection of SR3 and SR520 in the town of Merritt Island. Go north on SR3 to the first traffic light (Merritt Av), turn right and proceed east to the second traffic light and turn left, going north on Sykes Creek Parkway. Look for waterfowl on both side of the road. Cross the little bridge and turn left into the park. The entrance road dead ends at a fishing pier (vehicles are not permitted beyond this point). The trail goes both east and west. The east trail turns north to an observation tower. About a mile past the observation tower you reach an open area where you can observe waterfowl and other waterbirds. Ulumay is a mangrove/salt marsh habitat. It is good for waterfowl, wading birds, shorebirds and raptors. Bald eagles are not uncommon and black rails have been seen here in the early morning in the short grass area. For Information: Brevard County Parks & Recreation, 591 Cone Rd, Merritt Island, FL 32952, ph 407.455.1312. Go east towards the ocean on SR528 from I95. After you cross the Banana River turn left at the traffic light for the entrance to Port Canaveral (follow signs for South Docks and Jetty Park). Turn right at the stop sign on George King Blvd. Turn left on North Atlantic Av, then right on Jetty Park Rd to Jetty Park (parking fee $1.00 per car). As you bird the jetty area, look across the submarine turning basin for winter birds. In addition to the regular waterbirds, northern gannets, jaegers and other seabirds may be seen offshore in the winter. On the beach look for sanderlings, willets, red knots, ruddy turnstones, black-bellied plovers, piping plovers (rare), laughing gulls, ring-billed gulls, herring gulls, great black-backed gulls, Caspian terns, royal terns, sandwich terns (rare), common terns (rare), Foster's terns and least terns. Over and in the water look for common loons, red-throated loons (rare) brown pelicans, magnificent frigatebirds (rare) and black skimmers. Occasionally you may see a shrimp boat dragging near the shore with hundreds of birds following. These should be scanned for possible rare oceanic birds. Look north along the coast to see the land areas that form Cape Canaveral. When the air is clear you can see the missile gantries and the Cape Canaveral Lighthouse. Offshore you may see freighters, fishing boats, submarines, or missile tracking ships. On the way back out, go west on George King Blvd, turning left on Mullet Rd and wind your way west, going under the SR401 bridge. Eventually you will end up at the Port Canaveral locks. There's usually a lot of brown pelicans, wading birds, shorebirds, gulls and terns around the Port Canaveral Locks. To get to this park, go south on US1 from SR192 about four miles and turn right (west) onto Port Malabar Blvd (note - this is not the same as Malabar Rd); drive 1.6 miles to the sanctuary entrance located in the southeast corner of Palm Bay Community Center area. From I95 take exit 70A and go east on Palm Bay Rd, turn right at Babcock St (CR507) and proceed south; turn left on Port Malabar Blvd and continue east one mile to the Palm Bay Community Center, then turn right into the sanctuary. Turkey Creek is probably best known for migratory warblers. At least 20 different warblers have been seen here in migration including prothonotary, Blackburnian, golden-winged, chestnut-sided, hooded, worm-eating, prairie, cerulean, and yellow-throated warblers, also waterthrushes and ovenbirds. Turkey Creek has many different habitats including sand pine scrub, mesic hammock, hydric hammock, palmetto scrub and some open grassy areas. Part of the area is viewed only from a boardwalk, but some of the most productive birding is along the jogging trails - check out both. Turkey Creek is a blackwater creek, and the hydric hammock surrounding it supports such bird species as Carolina wrens, redstarts, ospreys, owls, hawks, egrets, anhingas, cranes, herons and cormorants; white pelicans winter here. Other species include quail, rufous-sided towhee, mockingbirds, cardinals, blue jays, blue grosbeaks, rose-breasted grosbeaks, woodpeckers, yellow-bellied sapsuckers, indigo and painted buntings, red-eyed solitary and yellow-throated vireos, yellow-billed cuckoos and northern orioles. As you pass the deeper area of the creek, look for large swirls of water which indicate the presence of manatees. These gentle creatures can be seen munching water plants along the creek banks. This is also the best area for waterthrushes. Park hours: 7:00am to sunset daily. For information: Palm Bay Parks & Recreation Dept, 1502 Port Malabar Blvd, Palm Bay, FL 32905, ph 407.952.3433. Sebastian Inlet, the best birding location on Brevard's south beaches (over 190 species) is located 17.5 miles south of SR192 on A1A. (Day parking fee $3.25 per vehicle). The tidal pool to the north is feeding ground for many shorebirds, wading birds, gulls and terns. Some unusual species have been observed here. Sandwich terns frequent the area in the winter. Check the rocky area leading from the tidal pool to the inlet for purple sandpipers. American oystercatchers and reddish egrets may be seen. Birding here is best in early morning before the area becomes crowded. West of the tidal pool is a grassy area edged by woods; check here for migrants, woodpeckers and raptors. Look in the mangroves at the river's edge for black-whiskered vireos in the spring and summer. East of the tidal pool is the North Jetty, one of the most popular fishing and surfing spots on Florida's east coast. In winter, on northeast and east winds look for pelagic species such as jaegers, gannets, and scoters. North of the north side entrance (about 200 yards before you actually turn into the park) is a little known but lovely hammock trail to the river with a rough path circling south along the Indian River Lagoon and back to the main trail. This can be superior for migrants, warblers, and scaring up chuck-will's-widows in late winter and spring. Ask a ranger for specific direction to the trail entrance. To get to SSRBP, travel south (from Palm Bay) on I95 to exit 70. Drive east about 1/4 mile; at traffic light turn right on Babcock St (CR507). Go south for about 11 miles and look to your left for SSRBP. The preserve entrance road is along the north side of the C-54 canal. If you cross the C-54 bridge, you've gone too far. The SSRBP consists of well maintained long leaf pine flatwoods with a low understory of saw palmettos and grasses. A hardwood swamp traverses the property from west to east and enters into a blackwater creek. Bachman's sparrows are abundant and can be heard singing from February to July. Brown-headed nuthatches, Eastern bluebirds, swallow-tailed kites, wild turkeys and quail are common. Florida scrub jay may be seen on Scrub Jay Road. There are several colonies of red-cockaded woodpeckers. There is a hiking trail and four horse trails that birders may hike. Hours: 8:00am-5:00pm. The preserve gate is locked promptly at closing. For information about SSRBP: Florida Department of Environmental Protection, P O Box 350 Fellsmere, FL 32948, ph 407.953.5004, fax 407.953.5006. Goodwyn is located on the St. Johns River Marsh in the southwest corner of Brevard County. Follow the directions for SSRBP above, but do cross over C-54 and the Fellsmere canals; turn right and go west along the canal for about six miles. Additional excellent birding sites include the area's numerous causeways, selected Brevard County parks and recreational sites, and state roads 46, 50 and 192 along the St. Johns River.